The Ash Footwear AW16 Campaign was shot in South Pigalle, a beautiful area in the North of Paris, not far from the stunning Sacre-Coeur Basilica. For this reason, we have chosen to feature this beautiful area in our second installment of our City Guides. The Hotel Grand Pigalle is a beautiful boutique hotel in the heart of the area with cocktail inspired details. Their Cognac-scented toiletries and craft beer stocked mini bars will appeal to the hedonist in you and get you set for a night out with your squad. For longer stays, or more home comforts, AirBnB is our go-to for stunning apartments rented out by locals who will be able to give you more insider tips on exploring the area and beyond. For a boutique shopping experience, head to Le Sept Cinq. This concept store showcases Parisian designed clothing, accessories and even stationary. Browse around for unique products and take a pit stop to refuel with a coffee from their in-house cafe. If you’re staying in an AirBnB, stock up on breakfast treats from Causses. This grocery store stocks all the locally sourced produce you will need to whip up a traditional Parisian breakfast before you head out for the day, as well as other delicious foods if you feel like cooking for yourselves one evening. Make like our campaign girls and dress up your jeans with some comfortable heeled boots and a blazer for your day our in the city. The Dakota Boots in rich cocoa brown have a beautiful autumnal feel whilst the Jenny Boots are perfect for working the embroidery trend into your outfit. For a boost of energy throughout the day, why not stop into Juice Lab for a healthy green juice. Lunch is served at Buvette, where you will find a wide range of meaty and vegetarian friendly dishes on offer, all made with locally sourced ingredients for a truly authentic Parisian meal. Head out into the evening with a little sparkle – Pull on the Drastic Boots in Midnight Glitter and indulge in some cocktails and dance the night away. Start your night at Chez Bouboule where you can sip on some delicious drinks whilst playing a game of the French national sport, Petanque – When in Rome! When the fun and games are over, head over to Pigalle Country Club for some dancing. This opulent bar serves up cocktails with quirky names, such as the Debbie Harry (an Ash muse!) and their DJ spins tunes from the owners own record label. This is the place to really party like a local. 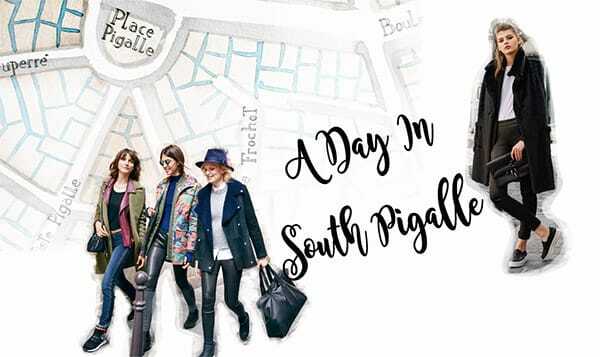 Have you ever visited South Pigalle? We’d love to hear about any hidden treasures you found on your travels!